Home Apartment Designs Small Modern Apartment Design Ideas Make Your Dream Come True! 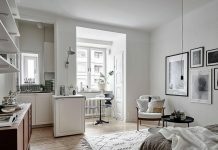 Small Modern Apartment Design Ideas Make Your Dream Come True! Choosing a small apartment as your dwelling place in the midst of urban area is such a good choice. Busy people tend not to pick housing area due to avoid loudness of transportation and inconvenience. Therefore, they seek a modest living space with a brilliant design. If you one of them, you are lucky searching a small modern apartment design ideas here because we proudly help you. Here we go! The first part of designing a small modern apartment is a living room. A living room is a good space to spend the rest of your time after doing daily routine outside. Therefore, You must be smart and brilliant in choosing the best design which is suitable for its furniture arrangement and decoration. First of all, placing all living room furniture near a big window is a good choice. Why? This is because of decreasing electricity usage in the afternoon such as the second picture. 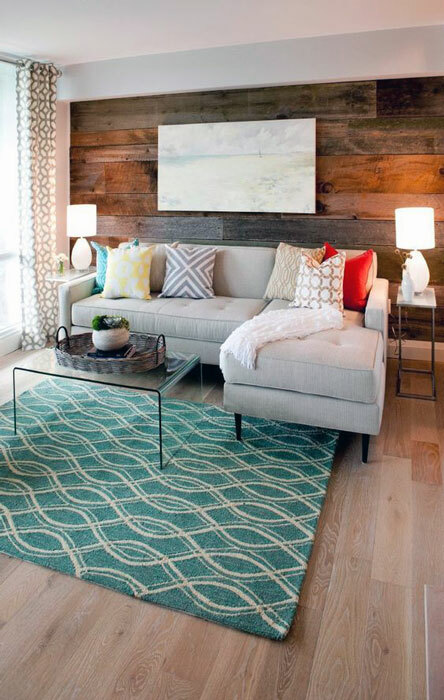 A bright light comes in through the window to enlighten a whole living room. Meanwhile, in the first and third picture, there is no window near them. Both of pictures utilize a bright paint color and furniture. 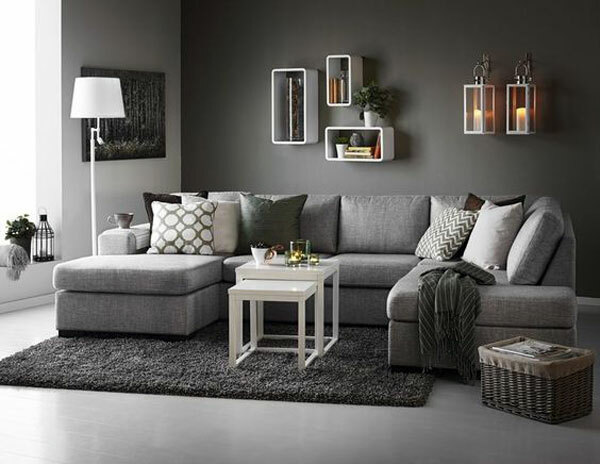 Another important thing of arranging living room furniture is placing all furniture correctly in order not to make the room becomes narrow. The three pictures show different design obviously. 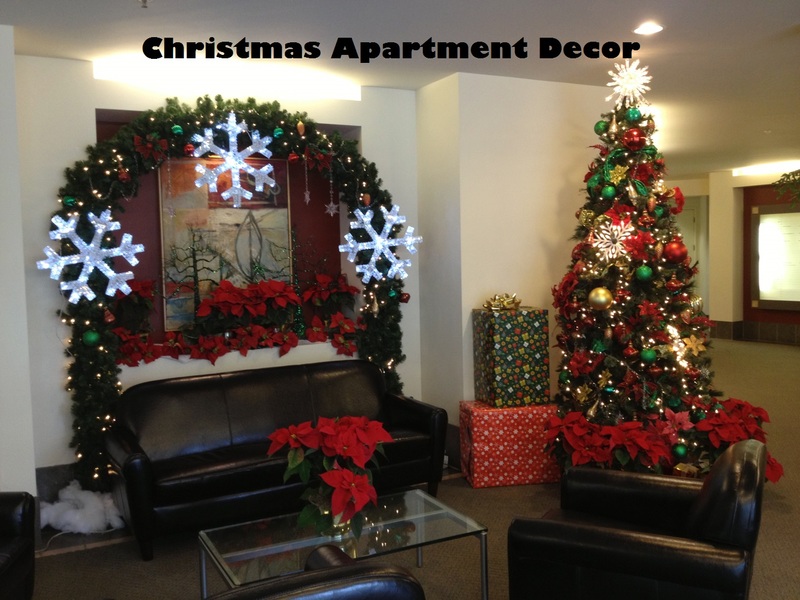 The first picture uses bright ornaments as its decoration such as L-couch letter-shaped, a bright white paint color, and a shade of light blue rug. The second picture shows a shade of brownish through the wooden material on the wall and flooring texture. For your information, wood is a proper material as furniture or decoration to produce a warm and classic-modern atmosphere inside your apartment. Meanwhile, the third picture uses a wooden flooring texture combined pastel colors. The second part is a bedroom as the best place to take some recess. Designing a bedroom with exact ideas will add positive energy while taking a rest and sleeping. 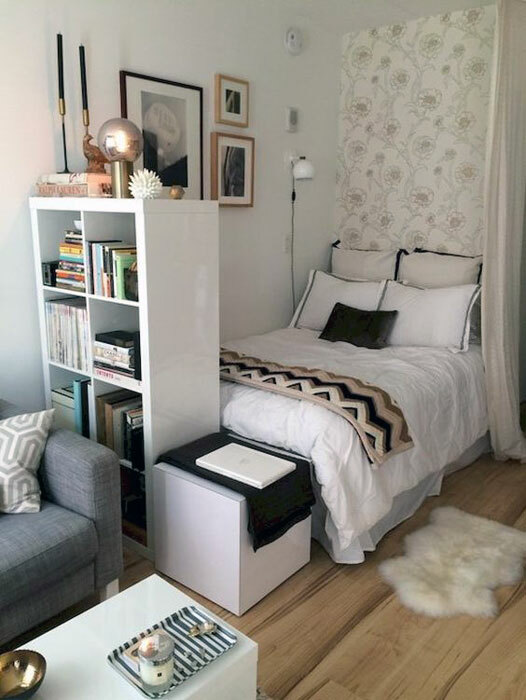 Having a modest bedroom space does not mean difficult to design it well. Here some ideas for you to be applied in your bedroom. Let’s check this out! There are three pictures of small bedrooms with different decoration as well. But do not worry, the three of them use neither difficult nor expensive decoration. 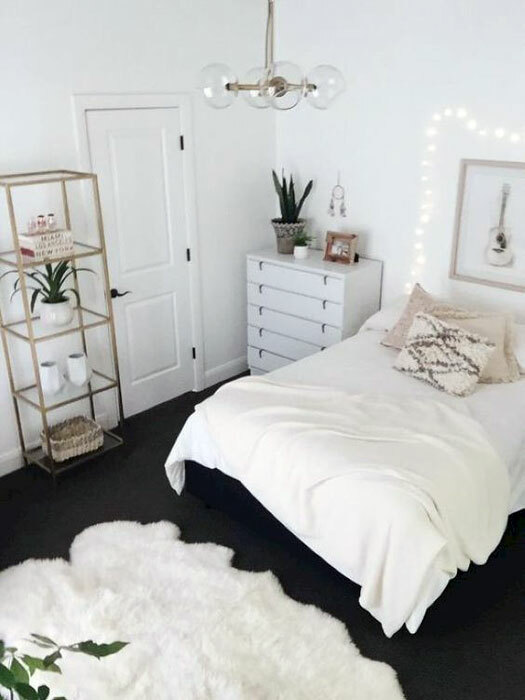 The first picture combines white and black colors as the main point of view in this bedroom. 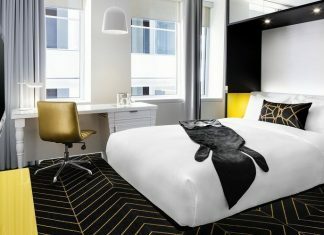 The combination of white and black colors produce an aesthetic view particularly being supported of its furniture as well. The second and the third picture use bookshelves as their decoration. A bookshelf can be placed near the bed or hung on the wall. 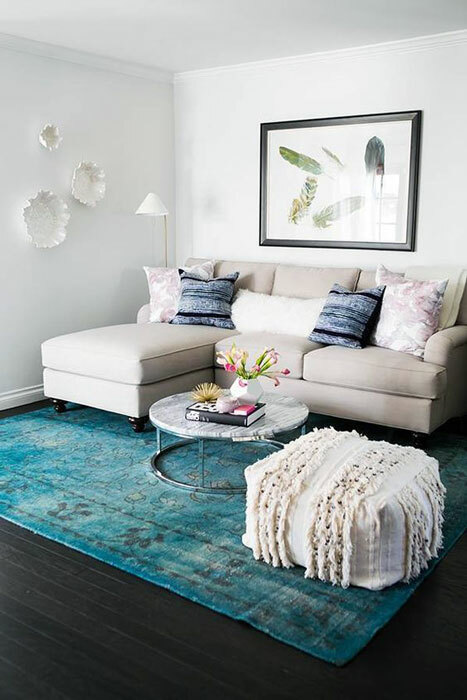 If there is much space, placing a small side table or couch will be better. As stated before, the first picture is combining black and white colors. Therefore, it looks brighter because of a bright white paint color in the whole bedroom. The second picture uses an exquisite floral wallpaper texture and paired with a bright white paint color as well. The third picture is totally blending a light white color with light grey color to make it more stunning. Applying one of three small modern bedroom designs above will make your bedroom as modern as these pictures too. 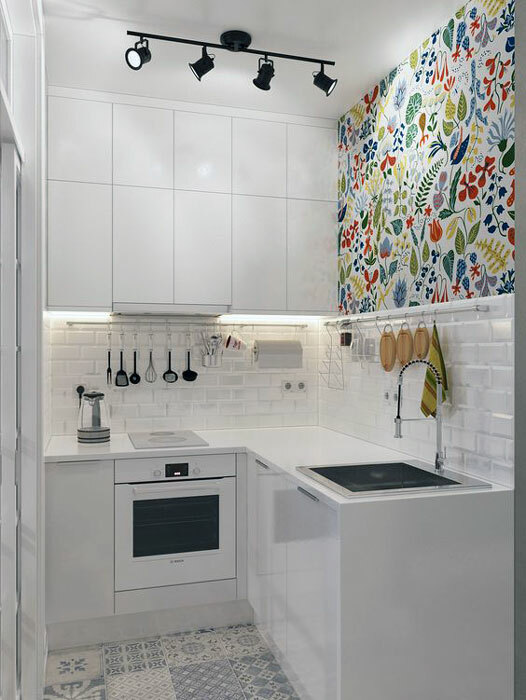 Here we are in the last part of small modern apartment design which is the kitchen. Designing a kitchen is a must! Having a good kitchen condition with brilliant design will add coziness in cooking so you will not spend much money to eat outside. Therefore, you should take a look some ideas here before re-designing your own kitchen. Before starting to design a kitchen, the first thing you must do is choosing a suitable kitchen set to be installed in your modest kitchen space. In the first picture, there is a white clean kitchen set which is fitted in that area. Please make sure if space is not narrow otherwise the kitchen set will damage its space. The second picture also uses the same shape with the previous kitchen which is an L-kitchen set shaped. This shape is suitable to be installed in a modest space indeed. The third picture uses an L-shaped but utilizing the longest part as a mini bar inside the apartment. 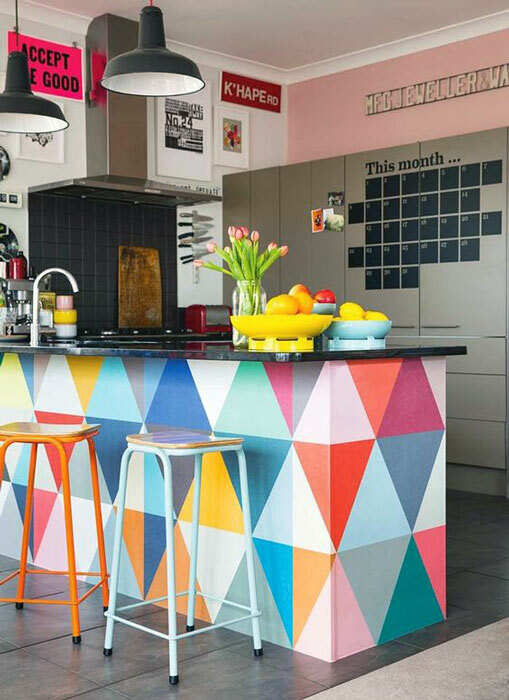 The kitchen is not the only kitchen if you can arrange creatively. After choosing a proper kitchen set, the next step is decorating your brilliant kitchen with a good decoration. The first picture does not use many colors because the main point of view in this kitchen is a white clean kitchen set. 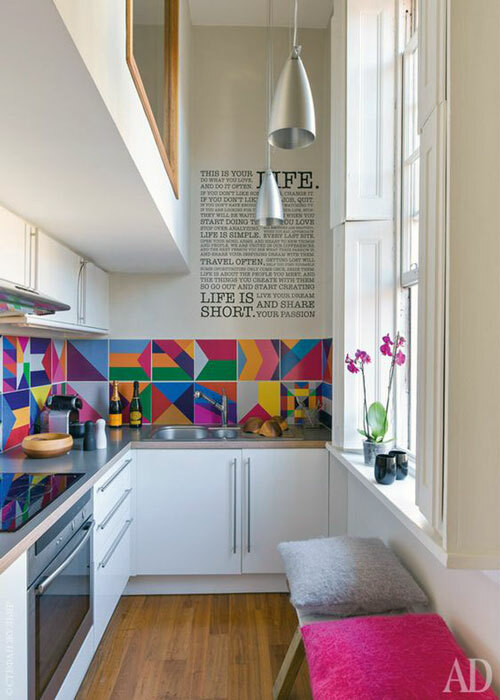 Therefore, the white decoration is perfect to be combined with colorful painting in the kitchen. The second and the third picture more colorful than the previous picture. The second picture uses colorful painting and words wallpaper to make it more comfortable. The third picture decorates the mini bar by using colorful scheme and more words wallpaper so will not make the kitchen looks monotonous. Do not waste your time to re-design your small apartment becomes more modern than before. 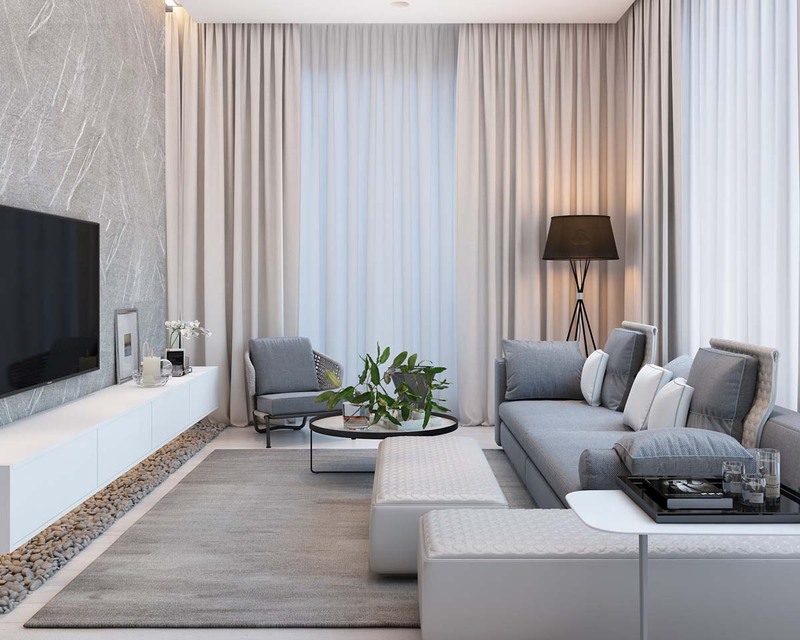 We suggest you small modern apartment design ideas to help and encourage you re-designing your apartment in three different main parts which are living room, bedroom, and kitchen. Happy trying! 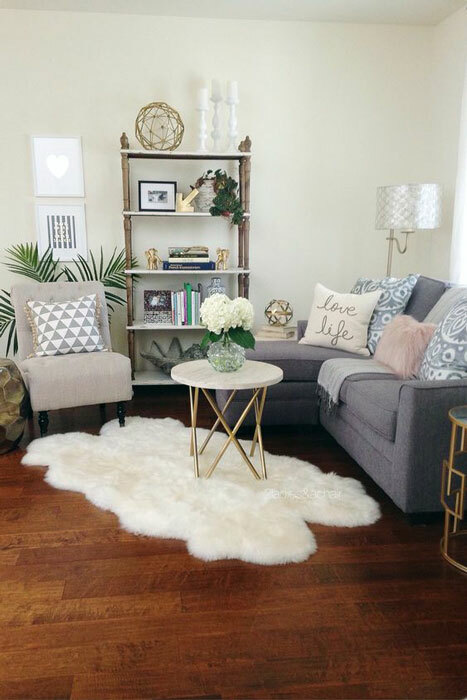 Previous articleBuying Furniture Tips || What Do you Need to Know Before Buying It Online!